The modulation matrix at the right of the Sytrus window is set and forget, while the modulation X-Y pad at the left is where the real-time action takes place. There is also a scribble scrip to put in information about your patch. Combining frequency and ring modulation with analogue-style resonant filtering, Image Line's Sytrus takes FM synthesis in new directions. Yamaha's DX7 put to pasture the analogue synthesizer of the mid-'80s. With bang for buck in the voices department and an all-new 'digital' sound, frequency modulation synthesis dominated the field for the rest of that decade; and like many other '80s fads, FM has made a bit of a comeback lately. Native Instruments' FM7 is a virtual update of the DX7, and there are numerous freeware and shareware FM soft synths out there. 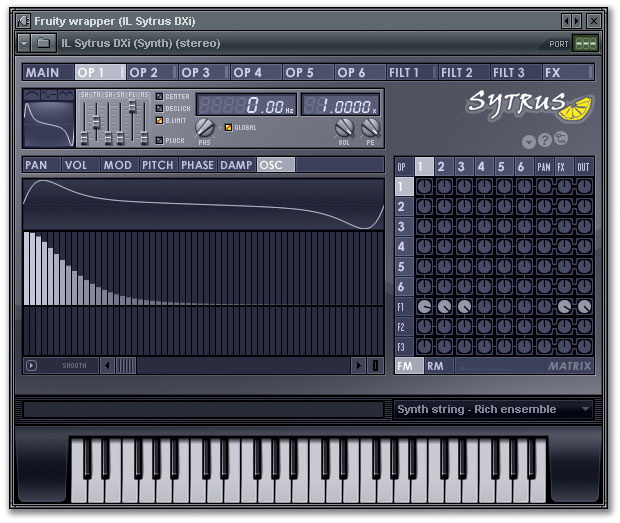 Bridging the gap between the expensive and the feature-limited is Image Line's Sytrus, a six-operator frequency and ring-modulation instrument in FL Studio native, VST and Direct X formats. Version 2 has just been released, adding new filters, arpeggiating envelopes and more presets to an already fulsome collection. FL Studio users will have to wait for FL Studio 6 to get the native version, although they can, of course, use the VST and Direct X versions now. Image Line also make the popular FL Studio host application, formerly known as Fruity Loops, so they aren't some T-shirt operation when it comes to synth development. 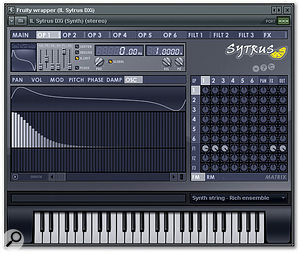 One of their synths for FL Studio was DX10, a simple FM synth, but Sytrus is in a different league altogether. Each voice not only enjoys six operators, but three filters, a chorus unit and three delay lines for effects, flexible multi-stage envelopes and extensive modulation capabilities, before one even gets to modulating any frequencies! There is a très cool assignable X-Y modulation controller, and an at-a-glance frequency/ring modulation matrix. The modulation matrix is at the heart of Sytrus 's FM capabilities, and allows control of every operator's audio output and the amount of FM applied to each operator. If you've ever upped an LFO into the audio frequency range and then used it to modulate the frequency of another oscillator, the clangorous results are a form of basic FM synthesis: many patches on the venerable Minimoog used the third oscillator this way to thicken and distort the overall timbre. FM synthesis as implemented in the DX7 and in Sytrus is far more complex, as each of the six available oscillators ('operators' in FM-speak) can modulate its own frequency or that of any other. Sytrus 's modulation matrix is a neat arrangement for seeing at a glance the overall algorithm (as the feedback and output structure that links the operators is called in FM synthesis), as well as the relative amount of modulation. Each 'knob' can be muted by right-clicking, which makes tracking down a wayward operator's modulation effect instantaneous. However, I wish the matrix itself could be expanded while setting levels without expanding the whole synth panel. The other big difference between digital FM synthesis and basic Minimoog-style analogue frequency modulation is the amount of control over the operator itself. In the DX7, each sine-wave oscillator has its own envelope generator. In Sytrus, every operator has its own envelope and LFO; in fact, every operator is its own single-voice synth in itself, with control over pan, volume, modulation input, pitch, phase and pluck damping. There is a tab for controlling the oscillator Shape, too, of which more later. All but the Osc Shape tab have their own envelope and LFO, as well as various other controller mappings. Each of these can affect the sound output, just as in any other soft synth. The power of FM synthesis, however, comes from modulating an audio operator (the carrier) with one or more other operators (called modulators). A single carrier modulating itself makes the output 'buzzier', and the fun starts when you alter the pitch ratio of the modulator: octave ratios produce harmonic changes to the timbre, while whole steps and cents produce inharmonic distortion that can get downright ugly. Judicious use of the amount of modulation and the modulator's envelope brings this distortion in and out. Sharp modulation with a quick decay is the basis for the infamous DX7 Rhodes piano sound heard on half the pop songs of the '80s, as well as the transient attacks of many other 'realistic' sounds. Sytrus also adds ring modulation to the fun, which generates new frequencies related to the sum and difference of the carrier and modulator frequencies, and produces a totally different tone from FM. While the implementation here does not sound as aggressive as many analogue ring modulators, it certainly provides another way to muck up your waveforms. Mention of waveforms brings us to the Oscillator Shape mentioned above. The DX7 dealt strictly with sine waves, while later Yamaha FM synths had the standard palate of wave shapes available. With Sytrus, you roll your own. Underneath the top row of tabs for choosing the Main and Operator pages are controllers for Operator Shape. Here you choose harmonics, then alter the wave shape via four faders named Shape, Tension, Skew and Sine Shaper/Pre-filter. While this is not as simple as picking from a given set of shapes, all the standard waveforms are there along with everything in between. All the changes show up in the oscilloscope display, while noise can be added via a fader before the output reaches the operator master controllers and the all-important Octave and Frequency tuning controls. Version 1.5 introduced a tab page for drawing in harmonics (along with a larger view of the waveform). Sytrus 2 allows you to lock the harmonics once you have the shape pinned down, and then export the resulting waveforms as audio. The settings for each of the six operators. The Osc tab allows you to draw in harmonics and provides a big oscilloscope view of the waveform. Both the envelope and LFO controller tabs also let you draw slopes and breakpoints, and the results can be saved. As you start to count up the number of controllers for each Sytrus operator, you get six times eight. That is 48, multiplied by six operators. Add in a 'plucked' mode in the Oscillator page, which disables the FM but uses damping to simulate the roll-off of plucked strings, and the variable wave shapes, and the permutations might start to hurt your head. If FM synthesis seems like a tweaker's heaven and rather intimidating, it doesn't have to be. Just because all the functions are available doesn't mean you have to use all of them all of the time. Many interesting sounds — including many of the presets available for Sytrus 1.5 — use only one or two oscillators. Alternatively, you don't need to use the frequency-modulation capabilities at all: you can use Sytrus as a conventional six-oscillator subtractive synth. With unlimited numbers of breakpoints in the envelope generators for each operator and filter, long, evolving patches are no harder to design than with any other synth. Image Line have also added a new feature for envelopes that I haven't seen before: arpeggiation. Arpeggiation points and directions can be added within the envelope slope, just like breakpoints. When a chord is held down, all the notes sound, but the envelopes alternate, adding a sequenced feel to oscillators, filters or anything that can be controlled by an envelope. Each of the Sytrus filters can be set to a gentle 12dB, a Moogish 24dB or an ultra-steep 36dB/octave mode, then passed on to the next filter. Version 2 adds another four filters to this list, in case the previous eight couldn't fill up your sonic plate. Low-pass, band-pass and high-pass filters are available all at once, as well as attendant envelopes, LFOs and other controllers for each type of filter. Another nice touch is control over the amount of filter resonance, not just cutoff. The sound of Sytrus leans toward the bright and digital, so it probably wouldn't be my first choice as a virtual analogue synth, although it can still do a respectable job. And with all the control available, it is more like a virtual modular rather than a hard-wired emulation. With six oscillators per voice, Sytrus can also do simple additive synthesis, and many of the organ patches use this technique. The Hammond and pipe organ patches will please all but the purists, but my favourite organ patches (and one of the reasons I originally got Sytrus) are the Farfisa sounds. They cut cleanly through the thickest mix, give a guitarist keyboard envy and make everyone else in the band want to cover '96 Tears'. Other voicings that FM and Sytrus do particularly well are bells and other such inharmonic instruments. The strings are good alternative if you are looking for something other than realistic samples or thick analogue string machines. Finally, spiky Clavinets, bright basses and a host of other sounds that will take you back to the mid-'80s are meat and drink to Sytrus. I encountered one or two problems with Sytrus, but nothing very serious. When I received the update to version 1.5, it defaulted to loading the DLL file into a different folder from the one where I had placed the original, causing a mixed-up image of the synth to be displayed. Deleting the old DLL and copying the new one solved the problem. The on-line manual is still rather brief; everything is there, but not in the most user-friendly form for an FM novice. The envelopes and LFOs are not calibrated by time or any other standard. In practice, this is not a bad thing, as it forces you to use your ears, not eyes, but can be disconcerting at first. Otherwise, Sytrus suffers only from the complexity of FM synthesis: unlike S&S or VA, changing a sound to make it more usable for the task at hand often involves more than just twisting a knob or two. However, Sytrus 2 ships with a couple of hundred preset voices, and is easy to use as a preset synth rather than a programmable one, if that is your bag, with the X-Y modulation controller offering plenty of scope for real-time manipulation. A quick Google search will get you the original DX7 patches and access to others, as well as more info on designing FM patches than most of us will ever use, while an on-line User Group at http://forum.e-officedirect.com/forum.exe?ForumName=FLStudio_SytrusPresets is the place to go to exchange or just download patches. Be aware, though, that most of these are saved in the FL Studio format, which won't load into other VST hosts; the only workaround is to download FL Studio (even the demo will work), then copy and paste the presets from an instance of Sytrus running in FL Studio to another running in your chosen host. Sytrus 2 includes some other small housekeeping updates, including subdued, translucent pop-up options/presets replacing the mundane Windows look in earlier versions. It won't do much for your sound, but is nice for the price — the update is free. FM synthesis will probably never again be as universal as it was back in the '80s — there are too many easier ways to get sounds now. However, Sytrus can add a whole other spectrum to your sound palate, even if you aren't a tweaker. There is an organic nature to the sound as the operators mutate one another in a surprising, and often unexpected manner. The addition of ring modulation and resonant filters add even more colour to the sound with little programming overhead. If you are not sure whether FM synthesis is right for you, you can download the demo version. It might not be worth the time it takes to learn FM programming, but it could be just the ticket for sonic explorations. FM synthesis with resonant filters. Makes FM synthesis about as easy as it can be without cheapening the feature set. FM synthesis is one of the more complex methods of sound production and Sytrus only makes it easier, not easy. Sytrus presets from the FL Studio site requires conversion from the '.FST' format before they can be loaded in other VST hosts. The reference manual is a bit thin in some areas, especially for beginners. 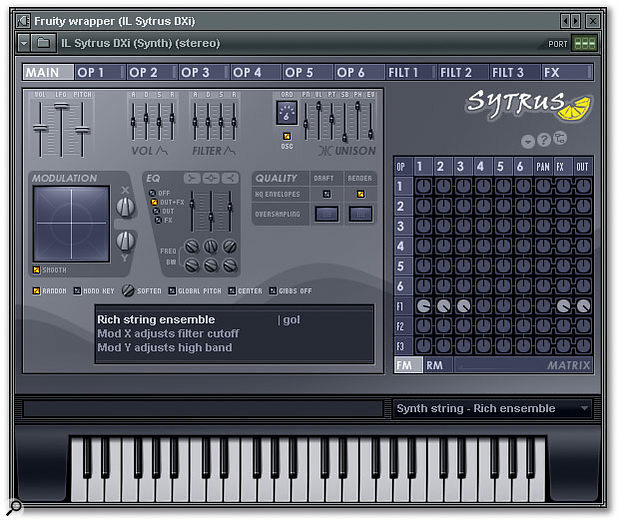 Sytrus is an impressive FM soft synth with a resonant filter twist. $179; bundled with XXL version of FL Studio. Image Line +32 9 281 15 01.